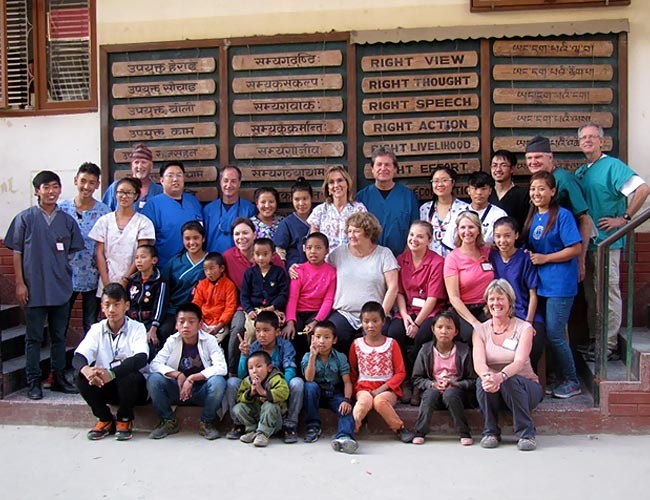 Thank you for your generous sponsorship of SmileTree’s Oct 31 – Nov 7, 2015 dental clinic in Kathmandu, Nepal. The clinic hosted a total of 12 volunteers who provided critical first time and follow up dental care to 944 children and their teachers. 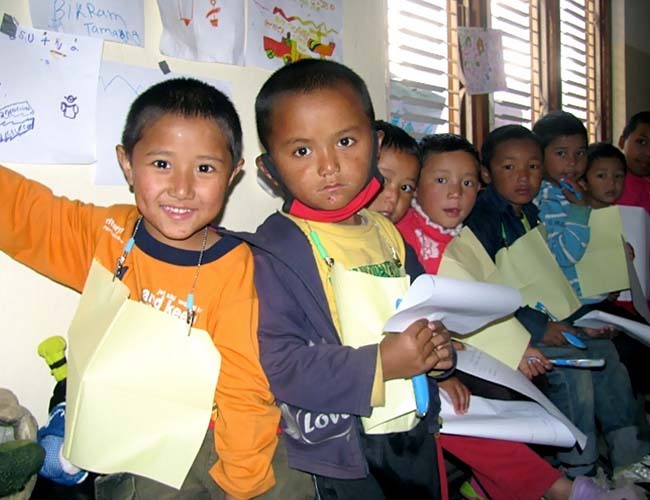 The twelve volunteers traveled to Nepal from six states in the US as well as from Canada. The group included 6 dentists, two hygienists, and four non-dental volunteers. The clinic was set up in a classroom of the Shree Mangal School in Boudha on the outskirts of Kathmandu. Senior students from the host school worked alongside volunteers assisting chairside, leading children in toothbrush instruction, managing the lines of children, and keeping instruments sterilized and stocked. This group worked a total of six days – days rich in cultural interaction and often long and demanding work. As you know, our model of care is to treat a school of children, seeing them class by class. Each child is given an initial dental exam, a new toothbrush and tooth brushing instruction. After their exam, children receive all necessary care – fillings and extractions – to bring them back to full dental health. This may take up to three visits to the clinic, and a strong effort is made to complete these visits during the clinic’s six days of operation. Each child also is given a preventive fluoride treatment and a dental cleaning when time permits. Most importantly, after each school receives the needed care, they are scheduled to return to the clinic every 1.5 – 2 years for checkups, oral health education and treatment as needed. We love these children with bright, eager smiles. Here they are shown waiting in line, showing the full range of emotions from anxiety to happy curiosity as they watch and discuss the happenings of the clinic before them. Dental clinics in developing countries often face unexpected obstacles and this clinic was no exception. The recently adopted Nepali constitution contains several controversial provisions that led to a boycott by India on fuel imports. This has brought Kathmandu to a standstill with day long petrol lines, a severe shortage of cooking fuel, and many schools closed or ill attended since buses and motorbikes lack fuel to drive. In response, this clinic focused on nearby children’s hostels and monastery schools – places where children remain in residence and could walk to the clinic. Yet dental need is so high in Nepal that even with these limitations, each day the clinic somehow was full to the brim. The SMD School generously shared their limited fuel supply to operate the generator during frequent power outages, allowing the clinic to function non-stop each day. The October clinic treated some populations for their fourth visit, meaning those children have been receiving care for up to eight years. The results are encouraging as we continue to see more well brushed teeth, reduced dental pain and a decrease in overall caries. Each clinic is special for the interactions between volunteer and child. Some patients begin with shy, even nervous smiles but typically by the time treatment is complete they turn to dentist and team and say “thank you.” Others are full of energy, giggling and running out of the clinic with open mouths pointing out their new work to groups of curious children. At the end of each day, volunteers’ minds are rich with memories of interaction across cultures and generations, and this is what makes this work so very special. On behalf of SmileTree, and the children we serve, thank you.